Your child will love hopping into the car knowing Marshall is along for the ride! 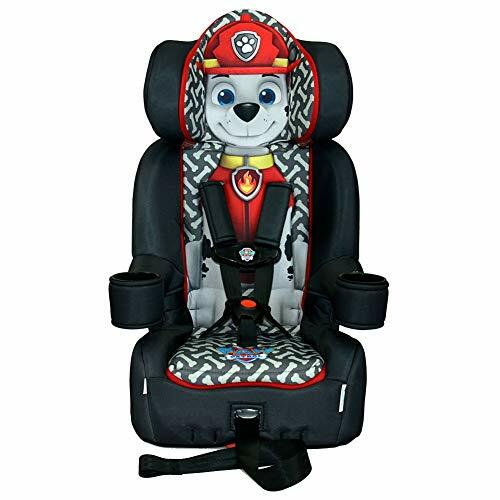 The KidsEmbrace Nickelodeon Paw Patrol Marshall 2-in-1 Booster Car Seat has been rigorously tested and exceeds Federal Motor Vehicle Safety Standards (FMVSS 213), plus it was given a "Best Bet" rating by the Insurance Institute for Highway Safety. Great for toddlers and older kids alike, this combination booster car seat is approved for forward-facing use with the five-point harness for children between 22 and 65 pounds and 29 to 49 inches in height, and it can be converted into a belt-positioning booster car seat for boys and girls between 30 and 100 pounds and 38 to 57 inches in height. The booster seat harness straps are easy to adjust with one hand. The crotch belt can be used in two different positions to accommodate your growing child, and the headrest can be adjusted to three different heights. The headrest also features energy-absorbing EPS foam for maximum side-impact protection. The contoured seat is comfortable for long rides, and the cushioned seat cover is machine-washable for easy cleaning. Two cup holders provide a handy place for drinks, snacks, or toys. The combination five-point harness high-back booster car seat is easy to install with or without LATCH and the top tether. It measures 19-1/2 by 19 by 29-1/2 (L x W x H) (headrest down) to 19-1/2 by 19 by to 32-1/2 (L x W x H) (headrest up), and it weighs 15 pounds.